The MarForm Formtesters series of ultra-high precision form measuring systems by Mahr are used whenever and wherever information on the geometry of close toleranced work pieces is required. Characteristics such as roundness, cylindricity, straightness, and parallelism are deviations of form and position. These characteristics are monitored by systems such as the MarForm MMQ 400. These high accuracy systems allowing you to fully exploit the allowed tolerance range, saving you time and money. 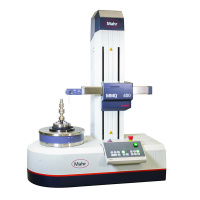 Mahr's line of surface metrology equipment offers fast, accurate and cost effective measurement of surface roughness parameters and geometric features such as distance, angles and radii (contour measurement). The MarSurf XCR 20 is an example of Mahr's new generation of systems that combine both functions in one simple to use touch screen based unit. The MarSurf M 400 portable surface roughness gauge is the first surface finish instrument to offer a cable-free Bluetooth connection between drive and evaluation units. The new MarSurf M 400 also incorporates a host of features to enhance the quality, versatility, and performance of the measurement. Systems such as the high accuracy ULM 300-E universal calibration instrument offers sub-micron measurement. Internal/external measurements are possible without re-mastering, and easily interchangeable measuring anvils provide increased part measuring versatility. The software provides clear easy calibration of plugs, rings, blocks, thread gages, dial indicators, and much more. Mahr offers an extensive range of products and solutions for your dimensional measurement tasks.